A New York taxi driver poses for the camera while car 433 of the Third Avenue Railway System passes in the background. Photo by Lewis Hine; George Eastman Museum. Lewis Hine was an early 20th Century advocate of what he called social photography—photography that helped bring about social change. He is most famous for his photos of child laborers, of immigrants passing through Ellis Island, and of construction workers building the Empire State Building. 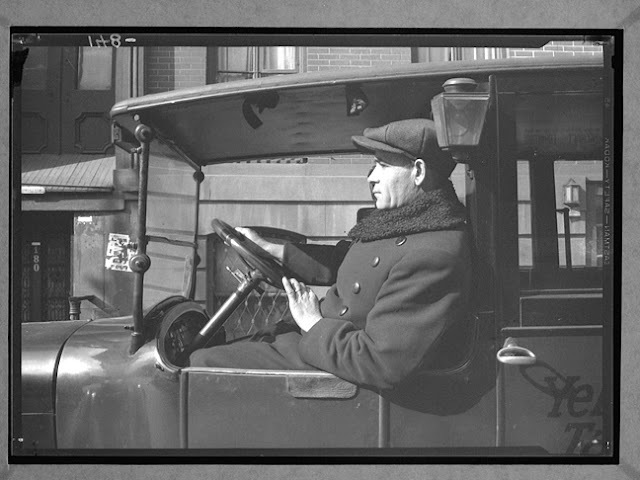 He also took a series of photos of New York City cabdrivers. (All photos courtesy of the George Eastman Museum). The double-breasted coat worn by this taxi driver would have looked right at home on a 19th Century hack driver. Photo by Lewis Hine; George Eastman Museum. The date given for these photos is “circa 1935,” but judging from the cabs it is more likely the 1920s. 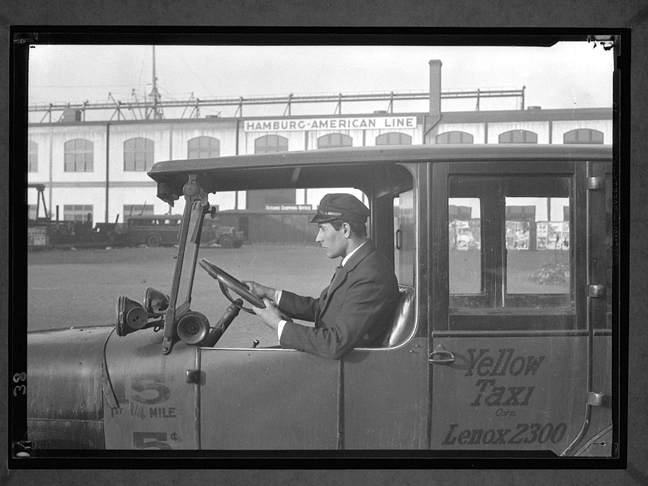 The cab in this photo still has carriage-style lamps on either side, behind the driver. Cities do not build themselves, machines cannot make machines, unless back of them all are the brains and toil of men. We call this the Machine Age. But the more machines we use the more do we need real men to make and direct them. Hine’s goal was to show the importance of labor even in this “Machine Age,” and to depict the dignity of workers. Then, the more you see of modern machines, the more may you, too, respect the men who make them and manipulate them. Photo by Lewis Hine; George Eastman Museum. There’s not much background variation in these photos, indicating that they were probably all taken in quick succession at the same location, perhaps at a cab stand. Here we see the first driver again, having moved forward slightly, perhaps a spot or two up the line. In this photo you can get a sense of how early windshields were designed. Before windshield wipers, a heavy rain could completely obscure the view through the front. To counteract this, the top part of the windshield could be swung outward, to create a gap through which the driver could peer into the rain. You can also see that this cab, like all the rest in these photos, had no passenger-side front door. The space next to the driver was for storing the passengers’ luggage; if the space was needed for a passenger, there was often a fold-down seat that could be called into service. And you can see that, although the passenger compartment is enclosed, there isn’t much protecting the drivers from the elements. No wonder that other driver was wearing such a heavy coat. Yellow Taxi with phone number Lenox 2300. Photo by Lewis Hine; George Eastman Museum. Here is another reason for the drivers to stare forward: to give their passengers privacy. 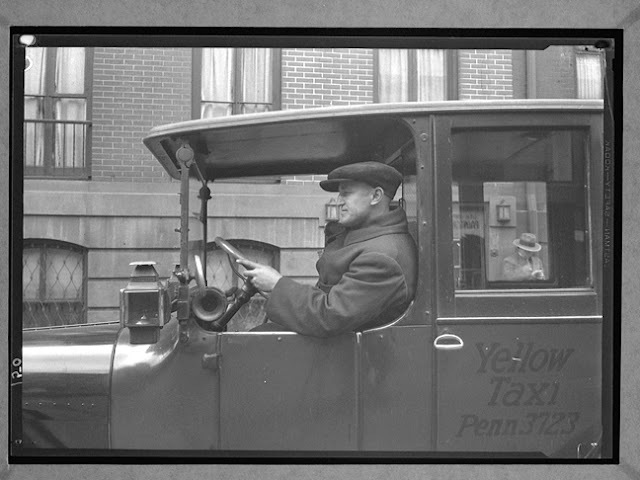 This photo gives a good view of the glass partition which separated drivers and passengers in early taxicabs. In horse-drawn days, closed carriages created a natural boundary between the interior space for the passengers (inside the carriage), and the exterior space for the driver (outside, “on the box”). This social distinction was eroded by the automobile. The glass partitions in these early taxicabs were meant to recreate the separation of social space between driver and passengers—but this also required the affective work of the driver in knowing when to separate himself from the private space of the passengers. Such in-cab micropolitics is the focus of a painting by Eugenie McEvoy, roughly contemporaneous with Hine’s photos, and fittingly titled “Lenox 2300.” In that painting (which you can see here) the driver stares straight ahead—just like in Hine’s photos—pointedly excluding himself from the intimate space of the couple in the backseat, whose reflection appears, nevertheless, in the glass of the partition just behind the driver’s hunched, stressed back. Yellow Taxi with phone number Penn 3723. Photo by Lewis Hine; George Eastman Museum. Although this cab, just like the last one, is labelled “Yellow Taxi,” it has a different phone number on the side: Pennsylvania 3723, linking through an exchange near Pennsylvania Station (as remembered in the song, “Pennsylvania 6-5000”). In other words, these appear to be the cabs of two rival cab companies, both named “Yellow Taxi” (the Lenox 2300 guys were first, and unsuccessfully sued their competitors for copying their name and color). 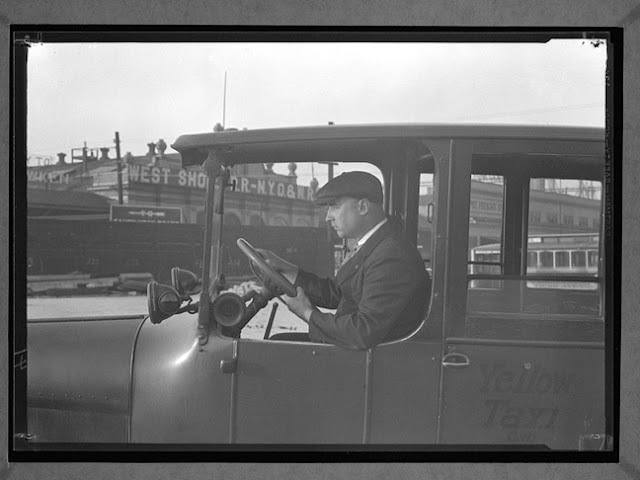 In fact, all of the cabs in Hine’s photos call themselves “Yellow Taxis,” even though they are evidently from different companies (judging from slight variations in the logo and paint scheme). 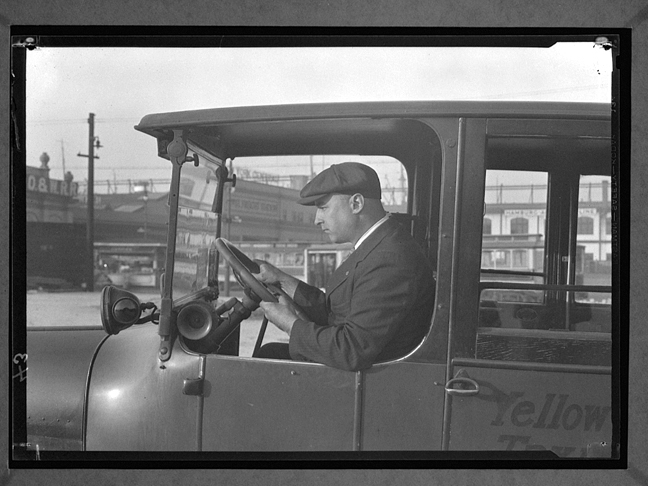 In Hacking New York, one of the earliest cabdriving memoirs ever written, old-time taxi driver Robert Hazard describes the color-coded taxi wars of 1920s New York, as taxi owners kept switching to whatever make and color of cab were most fashionable: first Brown and White, then Yellow, then Checker, and finally Brown and White again. 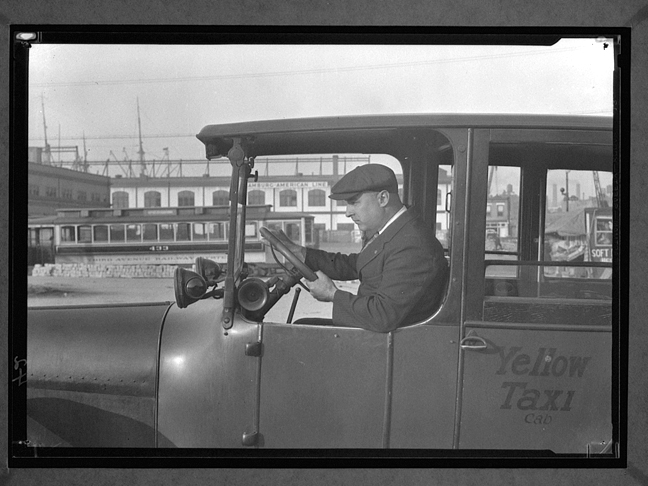 The city would eventually put a stop to this by requiring all cabs to have the same yellow and checkered color scheme. Our serious-looking friend has pulled further ahead in line, and is now in front of the West Shore railroad depot. Photo by Lewis Hine; George Eastman Museum.